1. The ios flash drive design with 2-in-1 interface get rid of iCloud, iTunes and USB cable. 2. Up to 30MB/s reading and 15MB/s writing speed for IOS devices. 3. Up to 80MB/s reading and and 30MB/s writing speed for PC. 4. User friendly free app, super easy to use the iphone flash drive. 5. The iphone flash drive possess various functions to meet your needs: take photos/ videos directly , backup and manage files easily, share files with social medias. 6. Encryption technology by passwords or fingerprints the iphone flash drive gives you safer privacy. 7. Stream videos / music / document files directly from the lightning flash drive, save space and time. Compatible with iPhone X / iPhone 8, 8 plus / iPhone 7, 7 plus / SE / iPhone 6, 6 plus/ iPhone 6s,6s plus / iPhone 5, 5s, 5c / iPad Pro / iPad 4 / iPad Air / iPad mini / iPad mini 2 / iPad mini 3 / iPad mini 4. Compatible with windows XP / 7 / 8 / 10 / Mac OS. Media files downloaded from iTunes or other 3rd party apps can not be transferred, as these files are DRM (Digital Rights Management) protected. 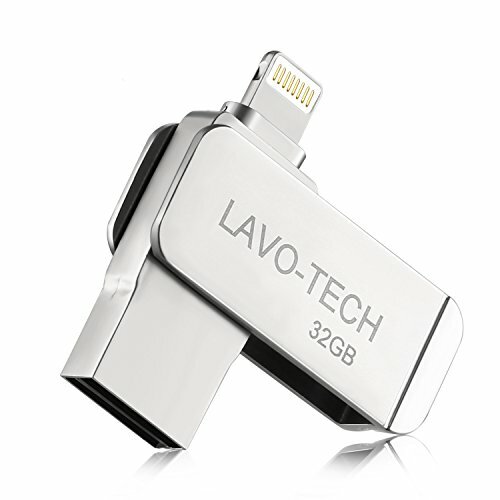 【EASY PLUG AND SPEEDY TRANSFER】Directly plug the LAVO-TECH iPhone flash drive into your lightning/ USB port; experience up to 80 MB/s reading and 30 MB/s writing speed with the ios flash drive. This iphone flash drive makes files transmission much easier and faster. 【STRONG STORAGE AND 2-IN-1 CONNECTOR】With 32GB external memory expansion, dual 8-Pin lightening port and standard USB port, the LAVO-TECH iPhone flash drive allows you to share and transfer data between multiple platforms, this ios flash drive quickly free up plenty of space on your iPhone/iPdad and keep more memory. 【POWERFUL AND USER FRIENDLY APP】LAVO-TECH ios flash drive possess various functions to meet your needs: 1.Take photos, videos directly to this iPhone flash drive; 2. Search feature help you find files quickly; 3.Backup and manage files easily; 4.Support VCF, ZIP files, easy to view the compressed file in the iphone flash drive; 5.Backup and restore contacts at one click; 6.Share files with social medias. 【ENCRYPTION TECH AND DATA SAFETY】The LAVO-TECH encrypted iphone flash drive can set Password & Touch ID to protect your individual file or the hole storage in the ios flash drive. The LAVO-THCH iphone flash drive is a perfect place to keep your private date safe. 【WILD COMPATIBILITY AND FREE WARRANTY】Lightning port is compatible with your iphone and ipad, the standard USB port is compatible with computers and laptops. 12 Months Worry-free Warranty, professional after-sales team and always ready customer services, If you have any question with the iphone flash drive please contact us anytime. If you have any questions about this product by LAVO-TECH, contact us by completing and submitting the form below. If you are looking for a specif part number, please include it with your message.